The Christine Center was created in the spirit of simplicity, stillness, and beauty. We receive you with deep hospitality. You may request a specific hermitage. Please note: In all cases we do our best to accommodate your housing requests however, we cannot guarantee you will receive the hermitage of your choice. At the time you make your reservation, let us know any food restrictions. We provide gluten free, vegan, and dairy free diets. If you have severe food allergies we may be unable to accommodate you in the dining room. You are welcome to bring your own food and stay in a modern hermitage with kitchenette. If you choose accommodations without a refrigerator, you may store a few specialty food items in our dining room refrigerator. The charge for dogs is $20 per night. There is no charge for a service dog– one that is trained for the purpose of assisting a person living with a sensory, mental, or physical disability or accommodating such a disability. You may be required to provide the credentials of a recognized school that trained the animal for this purpose, and you must clean up after your animal and pay for any damage it causes. Three of our hermitages are designated for pet owners with a dog–Rumi, Gabriel, and Joy–on a first-come-first-served basis. We welcome one dog (up to 50lbs) per designated hermitage. In consideration of all guests, dogs are not permitted into the main building, the Siloe bathhouse or the sauna. Please leave your pet safe and comfortable in your hermitage when visiting these buildings. When passing other guests on our roads, paths, and trails, dogs are expected to pause quietly at the owner’s side until our guests have passed by. For the sake of the contemplative spirit of the Christine Center and the well-being of your pet, do not leave your dog unattended outdoors at any time. For their safety, do not hitch your pet to anything outdoors, with the exception of the dog run at Rumi. Do not leave your dog on the run unattended. Hermitage furniture is primarily for humans. When you leave your hermitage, please help us prepare for the next guest by cleaning up any pet hair. Always leash your pet. It puts everyone at ease and protects your dog from potential mishaps. Always clean up and properly dispose of your pet’s solid waste. It helps maintain a beautiful walking experience for all our guests. We provide all bed linens, blankets, and towels. Casual clothes for the appropriate weather (we have a laundry facility for longer stays). Cash, checks, or money orders for lodging and meal payments or bookstore purchases. We also accept Visa, Mastercard and Discover credit cards. 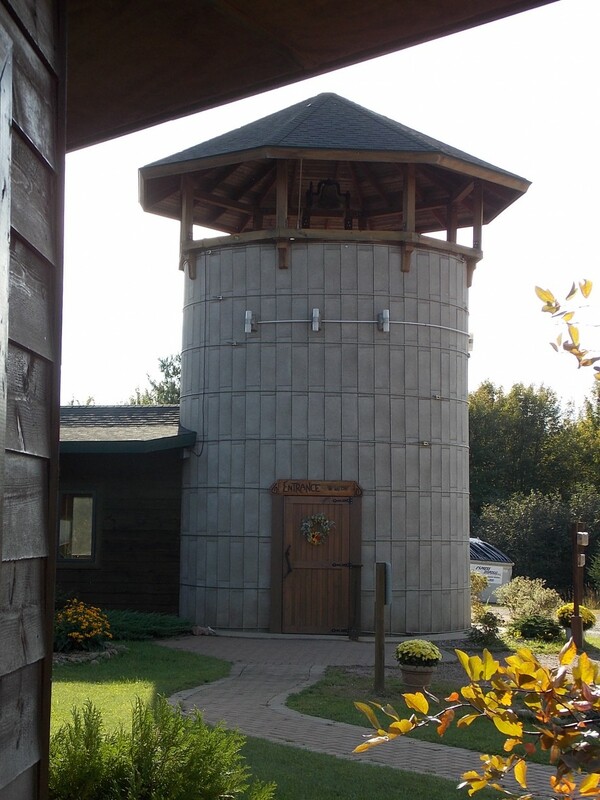 When you arrive at 3 pm or after, use the silo entrance (right) and check-in at the office. Coffee, water, hot water, tea, and fresh fruit is always available in our dining room. Wireless is available in the entire center building and in a few of the hermitages closest to the center. The sauna is heated with wood and takes about 40 minutes to heat up. Startup supplies provided. 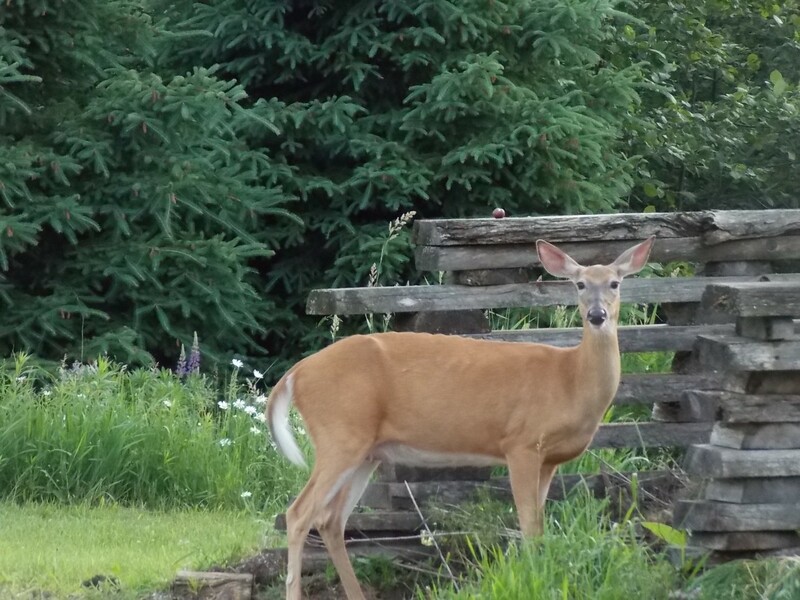 A neighbor enjoying our Compost Cafe. We practice composting and recycling to the greatest extent possible. After each meal, a compost pail takes scrapes to the compost bin. Plastic bottles, cans, cardboard, and office paper are all recycled. We heat the main center with geothermal heating. Our bathhouse, for those with rustic hermitages and for campers, is powered with solar panels. It’s a work in progress with more to come.